The long-delayed registration of the Jehovah’s Witnesses as a legal religious organisation has fulfilled one of Armenia’s international obligations, but has met bitter hostility from many individuals and church leaders. After nine years and 14 applications, the western church finally received legal status on October 12, in a country where the three-million-strong population belongs overwhelmingly to the Armenian Apostolic Church. 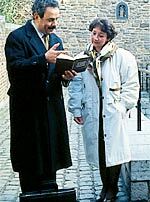 Jehovah’s Witnesses tell Armenians too about their beliefs (source: www.watchtower.org). By approving the move, the government met one of the civil rights requirements of the Council of Europe, CoE, which Armenia joined in 2001. Just a day before the October 8 registration, the CoE parliamentary assembly passed a resolution calling for speedier progress on the matter. Jehovah’s Witnesses – who say they have long faced persecution from the Armenian authorities, especially the military – welcomed the move. Hratch Keshishian, the leader of the group within Armenia, said the government had taken a “courageous step”. However, many people, particularly those connected with the Apostolic Church, remain opposed to the presence of the Jehovah’s Witnesses, saying that Armenian society and even national security are at risk. Claiming six million adherents around the world, the Jehovah’s Witnesses say they have 8,000 baptised members among a total of about 20,000 followers in Armenia. Keshishian said he doubted registration would lead to any rise in these numbers. But in a society historically centred around a single faith, the level of suspicion about proselytising newcomers is high, and the hostility is expressed in often virulent terms. The Jehovah’s Witnesses have run into trouble both from the established church, which opposes what it sees as attempts by Christian groups from the West to recruit among its flock; and from the military, which until this year was inflexible on the issue of conscription. As pacifists, Jehovah’s Witnesses are opposed to serving in any country’s army. The Armenian church leader, Catholicos Karekin the Second, called the Jehovah’s Witnesses a “totalitarian sect”, while Vahram Melikian, spokesman for the Holy See at Echmiadzin, the seat of the Apostolic Church, said they were “anti-Christian”. Melikian attacked the current law on freedom of conscience and religious organisations, saying it would “bring disaster” because it failed to make religious groups sufficiently accountable. Galust Sahakian, leader of the ruling Republican Party, opposed the decision to register the Jehovah’s Witnesses, saying that adhering to European standards should not “atomise our national values”, he said. The Republican Party’s youth wing, Baze, has opened a hotline for anyone wishing to report alleged illegal activities by Jehovah’s Witnesses. The government insists that Armenia has nothing to fear from the group. “We should not follow the path of banning [them], but should try to give them a chance. After that we should set conditions, follow them up, and if they violate the law, we should be able to stop their activities within the framework of the legislation,” said Prime Minister Andranik Margarian. He note that some three dozen other minority religious groups have been granted permits, including some that are perceived as more controversial than the Jehovah’s Witnesses. Mukuchian said it bringing the Jehovah’s Witnesses within the legal framework would make it easier to prosecute if there were any breaches of the law banning proselytism. The head of the government department for national minorities and religion, Hranush Kharatian, told IWPR she did not understand the fuss. Instead of calling for a clampdown on the Jehovah’s Witnesses, parliament should “create a legislative basis for introducing democratic values in our country. Kharatian denied that pressure from the CoE was the reason why registration was granted. Mikael Danielian, chairman of the Helsinki Association of Armenia and one of the country’s most prominent human rights activists, said that registration would not mean an end to difficulties faced by the Jehovah’s Witnesses. The group’s opposition to compulsory military service is a particular flashpoint, he said. Alternative military service was introduced in Armenia in July 2004, allowing those who refuse to carry arms on religious grounds to apply to the army authorities for some other form of duty. Since 1995, about 200 Jehovah’s Witnesses have been detained by the authorities as conscientious objectors. Keshishian said 11 people had been given prison sentences, but he hoped that those still in jail would now be freed. “The young men declared in the courtroom that they were ready to do an alternative form of working service, but would not go into the army,” said Keshishian. Zhanna Alexanian is a reporter with the Armenianow.com weekly. This article was first published on 28 October 2004 (CRS No. 259) by the Institute for War & Peace Reporting (IWPR), London. Posted on Religioscope with permission.